The in.lu.me cables and LED lights system were designed not only to be the perfect companions to the in.mix 300 lighting console, but also to dramatically ease the whole process of installing cables, lights and other equipment necessary to seriously light up your spa. The system consists of loop, spyder and cluster cables with high-intensity RGB LED lights. 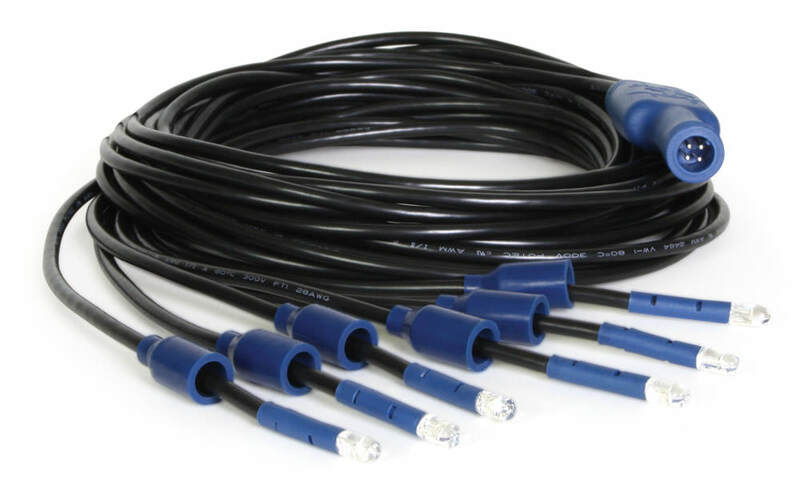 in.lu.me’s loop cables with 4 (at every 96”) or 8 (at every 48”) t-shaped connectors cleanly adapts to the contour of any size of spa. 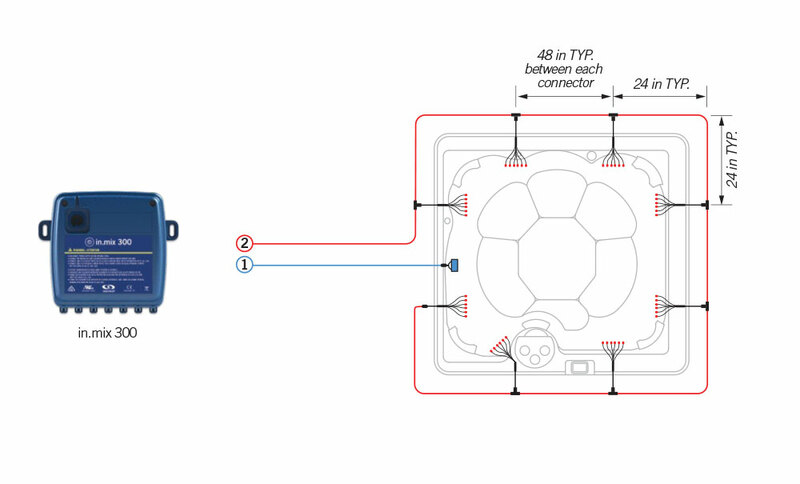 The 4 or 6 LED spyder cables and the 9 LED cluster can then be connected and positionned inside or outside the spa, in clean layouts, to create the desired light ambiance. The cleverly designed sturdy and water resistant connectors (IPX5), spyder and cluster cables can easily be connected to loop cables. Loops eliminate the need to daisy chain cables, minimize voltage drops and guarantee optimal LED intensities. in.lu.me also features bigger wire gage cables and more LEDs in spas. Once connected to in.mix, in.lu.me provides the spa user complete control on colors and effects from in.k1000 or in.k800 keypads or a smartphone running the in.touch 2 app. Put together, in.mix 300, in.lu.me cables and LED lights are simply the most comprehensive lighting system for spas and hot tubs. Simply connect the loop cables to the in.mix 300 control box zone connectors. in.lu.me is easy to install, requires no adapters, offers total flexibility, more points of lights and an infinite selection of colors through multiple clean configurations. The first connector on the left is a female 4 pin connector, which connects to an in.mix-300-lu.me output. All other connectors are 4 pin circular keyed connectors. The first connector on the left is a female 4 pin connector, which connects to an in.mix-300-lu.me output. All other connectors are 4 pin circular keyed connector. The connector on the right is a female 4 pin connector which connects to an in.mix-300-lu.me output and the connector on the left is a 4 pin circular keyed connector. in.lu.me-spyd-4 is a spyder module offered in a 4 LED configuration. in.lu.me-spyd-6 is a spyder module offered in 6 LED configuration. in.lu.me-EXT-5 is a 5 feet extension cord with circular keyed connectors at both ends. 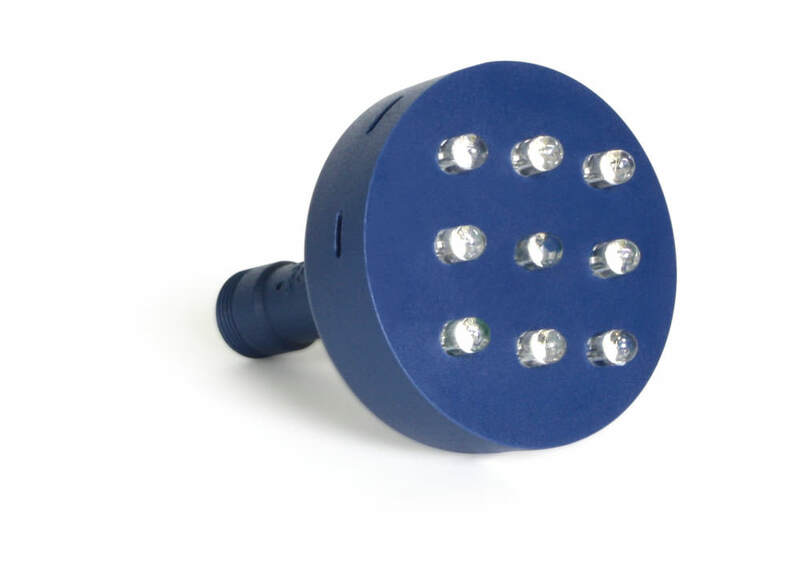 in.lu.me-CLUS-9 is a 9 LED cluster, PVC over molded that can be directly fitted in a lens/wall fitting.